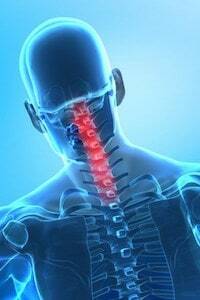 Cervical vertebrae fractures and disc herniation are some of the most serious personal injuries one can sustain. Sometimes these heal with immobilization and sometimes even surgical intervention is not enough to prevent lifetime consequences like paraplegia and quadriplegia. What is the composition of the anatomy of the neck? What are the most common causes of neck and spine injury and how does the law in California calculate damages in these cases? The human spine is composed of three areas, lumbar (or lower spine), thoracic (or mid spinal column) and cervical (the upper most portion). The cervical spinal column is composed of 7 vertebrae which connect the thoracic portion of the spine with the based of the skull. These levels are typically labeled C-1 through C-7, with C-1 being closest to the skull and proceeding C-2 through c-7 going downward. C1 is known as the “Atlas” and C2 is the “Axis”. These first two vertebra function together with C1 forming the actual joint connection with the skull and C2 forming the pivot upon which C1 rotates. Levels C-3 through C-6 form the main column between the connectors and are smaller and more compact and have small holes in the sides called “foramen transversium” through which arteries, veins and sympathetic nerve tissue passes. C7 is known as the “vertebra prominens” due to its distinct long spinous process. Through the “vertabral foramen” (space in the middle of the bone) passes the spinal cord which connects to the human brain and provides the base from which all human nerves stem (i.e. the base of the human nervous system). In between each cervical vertebra are small, soft discs which cushion the spinal column and provide flexibility in the neck for extension and flexion (forward and back movement of the head and neck) and rotation (side to side head movement). While it is possible to have disc degeneration from age, wear and tear or genetics, the number one culprit for fractures and serious disc protrusions or bursts is one thing: TRAUMA. This trauma can come in the form of a jolting movement forward and back or side to side from an auto accident, a fall, a blow to the head or some other similar event or a crushing of the spinal column from a direct impact to the top of the head. While fractures are fairly common at C2, they don’t normally cause neurological damage. Nerve damage is normally found in injuries to C3-C7 including vertebral fractures causing displacement or (at worst) as sever of the spinal cord and/or disc bulges causing nerve impingement. Significant disc herniation usually results in pain and/or numbness which can radiate to the chest, shoulders, arms hands and fingers. Damage to the spinal cord can result in paralysis to all or some parts of the body including the arms and upper torso and/or the legs and all of the lower body. It can sometime also cause paralysis of the diaphragm, resulting in respiratory failure. “Paraplegia” is deemed the loss of sensory perception and nervous function in the lower extremities while “quadriplegia” (or “tetraplegia”) is the loss in motor function of all limbs and the torso. Diagnostic tools for determining the level of injury include X-rays and Magnetic Resonance Imaging (MRI). Most commonly, cervical injuries require immobilization either with a cervical collar or a halo. Disc herniation injuries can sometimes be treated with physical therapy but, sometimes require surgical options including discectomy (the surgical removal of the disc portion impinging upon the nerve). Fractures sometimes heal with a significant portion of immobilization but can also require surgical intervention including a fusion of two or more vertebrae together to prevent further nerve damage. Any of these injuries or procedures can result in permanent loss of motor function or lifetime physical impairment. Calculating damages in cervical fracture and disc herniation cases really depends upon the level of the injury. In general, California law mandates compensation for the following: 1. Economic Damages: present and future medical expenses, lost wages and the economic value associated with loss of earning capacity, loss of ability to provide household services, loss of consortium (for a spouse); and 2. Non Economic Damages: monetary recompense for “physical pain, emotional or mental trauma, loss of the enjoyment of life, physical impairment, disfigurement, inconvenience, anxiety and humiliation.” (for a full description of “economic” and “non-economic damages” click here). Even in cases where a disc herniation results in temporary to permanent pain and numbness, this can seriously impair one’s ability to work and conduct household activities. This usually results in missed time from work and lost income. Surgery recovery time is usually several weeks to many months depending upon the level of injury and type of procedure performed. Post surgery, the patient will be expected to engage in physical therapy exercises which can be painful. A quality personal injury lawyer will communicate with the injured person as they go through these stages of recovery to fully understand and be able to describe to a claims adjuster, defense attorney or jury as to how to value these claims. Medical documentation and wage loss documents will be gathered and presented. In the case of catastrophic cervical spinal injury resulting in paralysis, the future medical expenses should always include the highest value possible for home health care, medical apparatus and equipment (e.g. wheelchairs, walkers, etc.) and all other necessary medical needs including physical modification of residential facilities. Obviously, the loss of the use of limbs for the rest of a person’s life should translate into an extremely high award for physical impairment and emotional anxiety and distress, which should be extrapolated over the life expectancy of the victim.